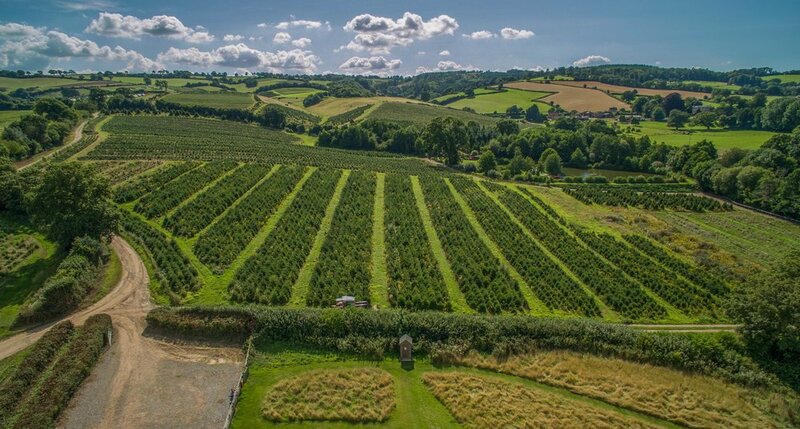 Our well established Christmas tree farm is located just outside Enmore on the Edge of the Quantock Hills, four miles from Junction 24 in Somerset. 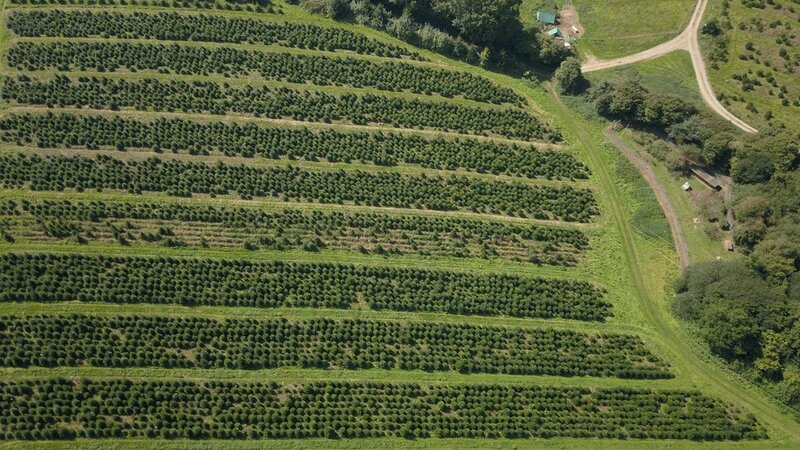 Well known for its home grown, beautifully shaped, freshly cut Christmas Trees. 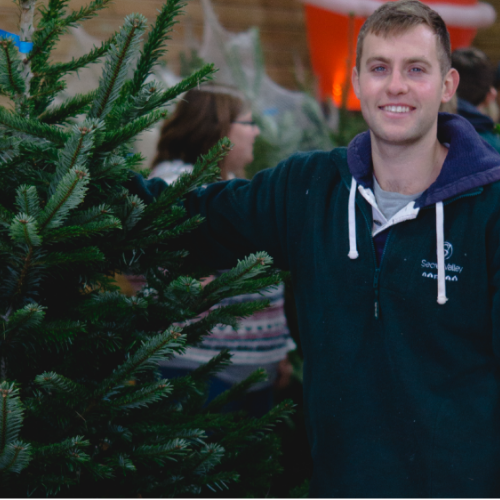 Our expert and friendly staff will help find the perfect tree for you. Secret Valley's John Hardwick former chairman of the British Christmas Tree Growers Association has grown the most superb, fresh Christmas trees covering over 50 acres for just over 20 years. The Farm, run by the Hardwick family are passionate about the trees they grow, and incredibly proud to be part of other peoples Christmas preparations. Nordmann Fir (the "Non-Drop" one). Renowned for its needle retention this glossy green Christmas tree has soft needles making it a great choice for families with young children or pets. It’s traditional shape and practicality make this our most popular tree. We also sell pot grown & potted Christmas trees (both up to 5ft) as well as Christmas Tree Stands & Holly Wreaths. Want to enhance that festive Christmas tree scent in your home? Purchase one of our new “Christmas Spruce” scented candles! Available to buy from our Christmas Shop. Part of the magic of Christmas is wrapping up warm, pulling on our wellies and tramping out to the countryside to choose a freshly cut, good quality Christmas Tree. Mince Pies, Gingerbread Men and Coffees. The New Secret Valley 'Christmas Tree Spruce' Fragranced Candles (A Great Complimentary Good with the Christmas Tree). Pot grown & potted Christmas trees (both up to 5ft) as well as Christmas Tree Stands and Holly Wreaths. Secret Valleys home grown Wine (Red, White, Rose and Sparkling on offer to taste). Beautiful Miniature Donkeys (Milo and Milly are the crowd favourites incredibly tame and very cute!). Write a letter to Santa and post it at Santa's Post Office. Visit the Nativity and Arctic scenes. Snowball fun area for children under 10 years. We grow over 180,000 trees, so we will never run out. Remember, trees are very similar to cut flowers and need to be looked after, kept away from heat and watered regularly. When looked after correctly you will have a beautiful Christmas Tree throughout the whole Festive period. We advise you to use a good water holding stand to put the tree in. In our shop we offer an excellent range of water retaining stands which your tree will need, they are also very easy to use. All trees are netted before you leave and a member of the team will be happy to assist you with securing your tree in your car. To get the most out of your Christmas tree this year, follow these guidelines. We recommend you treat your Christmas tree like a cut flower, cut 1/2 inch off the trunk (stem) before putting it in water holding stand. Keep it topped up with water as you will be surprised a just how much it will drink. Remember, the better watered and cooler you can keep it, the longer it will last. Norway Spruce (The "Traditional" one). This traditional tree has dark green spiky needles and a beautiful Christmas tree scent. Although sometimes criticised for it’s needle drop, we cut our Norway Spruce trees daily. This freshness means that our trees have fantastic needle retention. Please, be aware, trees that are cut same the same day need to be left outside for minimum of 24hrs. Fraser Fir (The Christmas Classic). Frasers are generally a narrower tree which makes them perfect for a smaller room. With green silvery soft short needles and that classic Christmas tree scent, they are great for young families or people with less space. We do deliver wholesale trees at a cost which can be supplied periodically within the Christmas period. The Christmas tree is the focal point of the season and no office or building is festive without a proper large tree. 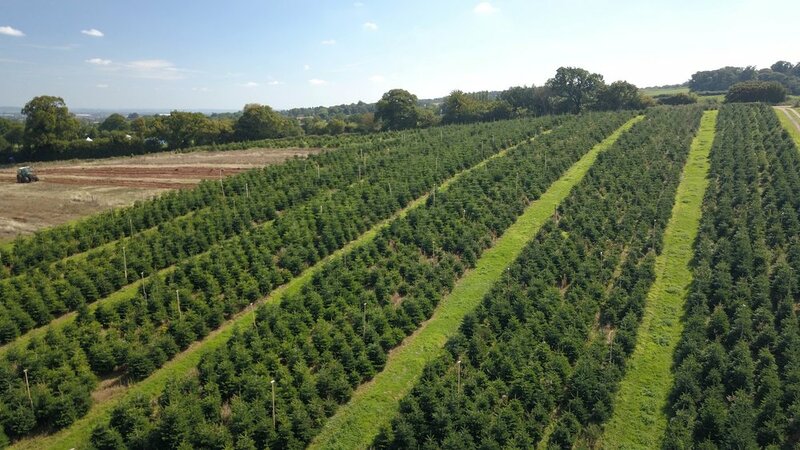 We pride ourselves in supplying and growing trees up to 18ft. They are ideal for towns centres , communities, churches , schools, restaurants and businesses, etc. We can supply and deliver. You can get your desired size, quickly and without any hassle to you, we take care of it. We deliver within the whole of Somerset, delivery charges apply. We are so thrilled you are considering visiting Secret Valley Christmas Trees. There is so much to see and experience on site. We want you to make the best from your time with us and to do so here are few tips for you as you prepare to visit. To easily find us, touch here for directions. If you want to wander around, please wear appropriate shoes and come during daylight hours only.